Has Virgil Abloh's Success Come as a Result of Copycatting? Virgil Abloh speaks on stage at the WSJ. Magazine 2018 Innovator Awards Sponsored By Harry Winston, FlexJet & Barneys New York - Inside at MOMA on November 7, 2018 in New York City. While we were still applauding the seemingly unstoppable force that is Virgil Abloh for bringing it “Home” with his Wiz-inspired second collection for Louis Vuitton, some very valid questions arose about the much-lauded designer’s inspirations. While fashion is nothing if not derivative—and plagiarism is nothing new at all—sadly, these allegations come from within the ranks of the black fashion community. Model-turned-accessories designer Michelle Elie was the first to call out Abloh (this round), after Off-White’s Fall-Winter 2019-2020 collection titled “Public Television” premiered during Paris Fashion Week. Specifically, Elie accused Abloh of ripping off designs her son’s line COLRS sent down the runway for Lagos Fall-Winter Fashion Week 2018. “It could be a coincidence, but Virgil has been known to swipe designs from the fans he meets, some of who happen to be young creatives themselves,” Diet Prada captioned their discoveries. “Interestingly enough, [designer of COLRS] @punkzec met Virgil prior to one of his presentations in Paris in 2017. Think they talked design?” they coyly added. 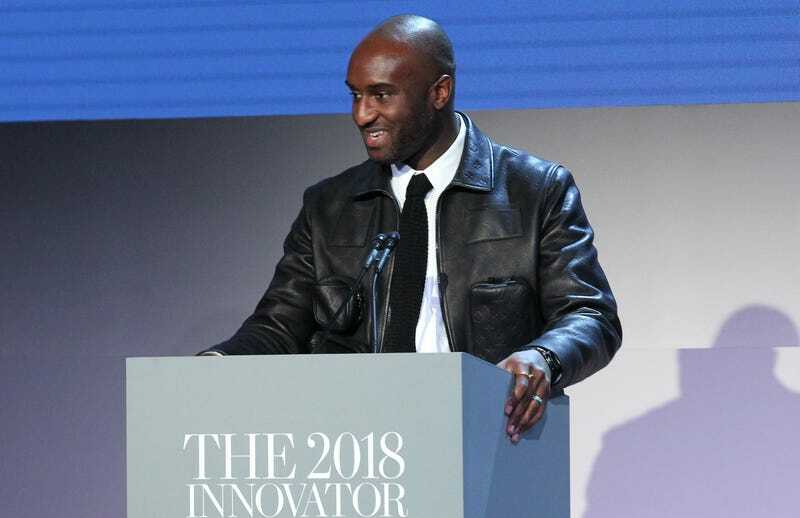 It’s an interesting and ironic twist on Abloh, who has admitted to suffering imposter syndrome as his profile in the fashion industry has not only grown, but exploded. Though he interned at Fendi alongside good friend Kanye, later helping to launch Ye’s now-defunct line Pastelle and later, Yeezy, Abloh’s ascension into the big leagues came via his own line, Off-White. His seemingly innovative, on-the-nose designs catapulted him into the fashion elite—and last year, secured him the bag as creative director of menswear for legacy French luxury house Louis Vuitton. But is the pressure causing him to plagiarize? Because how creative is Abloh, really? Aside from the obvious influences in his latest Off-White presentation, another fashion-watcher caught yet another direct rip from yet another black designer in last week’s presentation for Louis Vuitton—which might explain why we felt such a kinship with the collection. Since we regularly cover both designers, we’re kicking ourselves for not noticing it ourselves, but damn if the American flag scarf Abloh sent down the runway last week isn’t a grayscale version of the one Kerby Jean-Raymond designed for Pyer Moss in his “American, Also” Fall-Winter 2018-19 collection. Virgil, baby. What is you doing? That’s the question this writer and fashion lover is asking, as I so desperately want all these black designers to win—but not by any means necessary, and certainly not by ripping each other off (particularly not for French fashion houses, Virgil). But once again, we are reminded to beware false idols. Only time will tell if Abloh really has the goods to maintain legitimacy and longevity, but hopefully, he’s now fully aware that these fashion streets are watching. Then again, maybe the joke’s been on us all along.